Nail Polish My Ten Friends Dirtball, The second company I purchased from during Cyber Week was My Ten Friends. 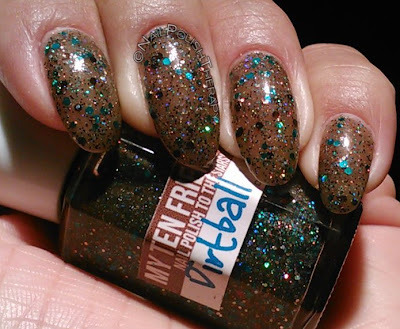 I heard about them from Chalkboard Nails and I fell in love with Dirtball. The color was so unique and I love the combination of brown and turquiose which are two of my favorite colors. With Dirtball I also purchased: Carbon Based Life, Pew!Pew!Pew! and Clusterfrak. The owner of the shop contacted me before shipping my order to let me know there was a problem with the XL hexes in 2 of the colors that I order and was nice enough to give me the choice of what I wanted to do with those two polishes. Good thing for me Dirtball was not affected. Because of the excellent communication and customer service I would definitely repurchase and to say nothing of the polishes, they are truly must haves. 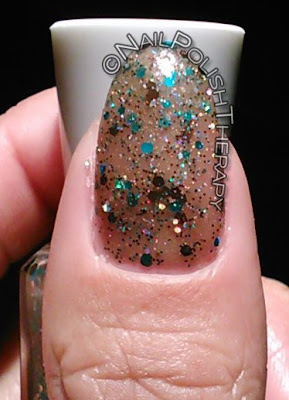 Dirtball made me gasp, and I don't do that with many polishes. Application was a dream and I could not get over how GORGEOUS the combination of glitter with the light brown base was against my skin. I could not stop staring at my nails and I almost put on a third coat but you really don't need too. I enjoyed this polish thoroughly and can easily say it is one of my top 5 fav of all time. 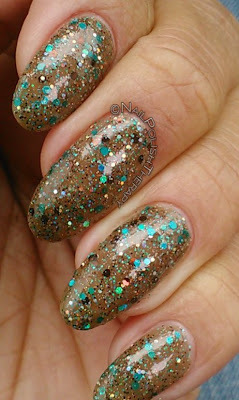 It's the turquoise hex glitter with the silver and copper glitter together in the brown base that make this so special. I'm so happy to have it and I hope you'll like it too. Thoughts?Feelings? Concerns?